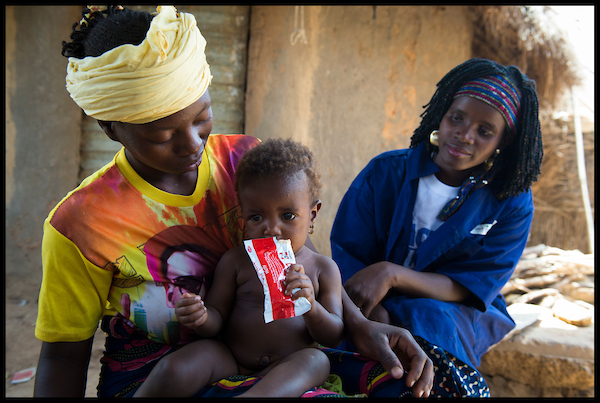 On average, more than 70% of children worldwide with uncomplicated Severe Acute Malnutrition (SAM) are cured when treated with Ready-to-Use Therapeutic Food (RUTF) at outpatient health centres (Lenters LM et al 2013). However, less than 1 out of 4 children affected are able to access the treatment they need (UNICEF 2018). Common barriers to access treatment include long distances to health facilities, transport costs and other opportunity costs to caregivers. The Integrated Community Case Management (iCCM) model has been an effective approach to increase coverage of treatment for other life-threatening conditions such as diarrhoea, pneumonia and malaria in Mali for almost a decade. As part of iCCM, Community Health Workers (CHW) are trained, supplied and supervised to diagnose and treat children with these diseases. Consequently, expanding the iCCM model to include the diagnosis and treatment of SAM may address some of the current barriers to receiving effective and timely management. 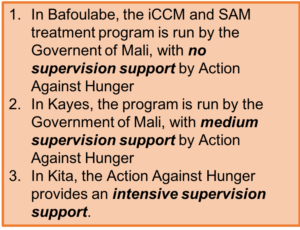 To this end, Action Against Hunger collaborated with the Government of Mali to investigate the use of CHWs and iCCM to improve coverage of high-quality SAM treatment and to generate the evidence needed to inform the scale-up of this program. A multi-phased approach was used to first pilot, and then to further refine this idea. Phase 1 of the project consisted of a prospective multi-centre cohort study, which investigated the effectiveness and cost-effectiveness of this innovative approach. The study took place in 7 communes in the district of Kita in southwest Mali and was conducted in partnership with the Institute National de Recherche et Santé Publique (INRSP), the National Nutrition Direction of the Ministry of Health and Bamako University, and funded by the innocent foundation. In the control communes of Tambaga, Bougarabaya, and Kobiri, outpatient SAM treatment was provided by Health Workers at the primary health facilities (as per the standard Community-based Management of Acute malnutrition (CMAM) approach). While in the intervention communes of Guenikoro, Kassaro, Dafela, and Sebekoro, treatment was provided by both the primary health facilities and by 18CHWs, trained and equipped to treat uncomplicated SAM cases in the community. The results of the Phase 1 pilot study are summarized in Box 2. Costing and cost-effectiveness analyses of the three models of supervision. The Phase 2 study is still ongoing with results expected in 2019. So far, it has measured the baseline coverage in the three districts participating, trained CHWs in the treatment of acute malnutrition and the standard iCCM package (the management of diarrhoea, malaria, pneumonia, family planning and hygiene promotion), and admitted a total of 1,085 children with SAM to the study. Discussion is ongoing with the Ministry of Health to define a practical guide adapted to the reality in the country for the scaling up of the intervention. There have been several lessons learned throughout the Phase 1 and 2. The research demonstrated that CHWs can manage the diagnosis and treatment of SAM while maintaining a high quality of care, with high cure rates and low default rates. This approach was also proven to overcome key barriers of treatment access and coverage by bringing diagnosis and treatment one-step closer to the community. Mothers and caregivers spent half as much time, and one third of the cost, under this model compared to the standard CMAM treatment. One of the main reasons for the success of this intervention in Phase 1 was the capacity and availability of CHWs as part of the existing health infrastructure in Mali. Salaries for all CHWs in Mali are currently paid for, with commitments through 2019. As we look forward to scaling-up the integration of SAM treatment as a part of the CHW-delivered iCCM package, it will be critical to ensure the Government of Mali and partners in country continue to support CHWs as part of the public health system, with dedicated funding for training, supervision, their salaries in the long-term. The final learning from the project was the importance of the integration of SAM into iCCM from the beginning – from the training of CHWs, to implementation and measurement of care quality. The country’s policies on specific set training modules had to be adapted, in order to properly integrate treatment of acute malnutrition as a core piece. 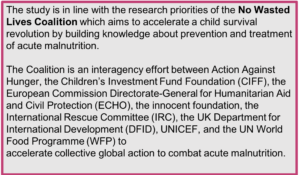 Simply ‘tacking’ acute malnutrition onto the CHWs workload would not ensure optimum outcomes for the children treated. Understanding how additional goals, tools and training would affect the CHWs was essential to the success of the program. Adapting the protocol to a security context (North Mali crises). In addition to scale-up in Mali, the success of the original pilot has spurred similar implementation research in Kenya, Niger and Mauritania. There are further contexts where this intervention could be useful, particularly where there is high prevalence of global acute malnutrition (GAM), low coverage of malnutrition treatment, and support from the Ministry of Health. Further implementation research will be critical in the successful expansion of this approach. Lenters LM, Wazny K, Webb P, Ahmed T, Bhutta Z. Treatment of severe and moderate acute malnutrition in low- and middle-income settings: a systematic review, meta-analysis and Delphi process. BMC Public Health. 2013; 13 (Suppl 3): S23. Available at: https://www.ncbi.nlm.nih.gov/pmc/articles/PMC3847503/. United Nations Children’s Fund (UNICEF), World Health Organization, International Bank for Reconstruction and Development/The World Bank. Levels and trends in child malnutrition: key findings of the 2018 Edition of the Joint Child Malnutrition Estimates. Geneva: World Health Organization; 2018 Licence: CC BY-NC-SA 3.0 IGO. United Nations Children’s Fund (UNICEF). Global SAM Management Update Tool (NUTRIDASH): 2018 data. Available at: www.acutemalnutrition.org. Action Against Hunger would like to thank our partners and funders: the Government of Mali, INRSP (Institute National de Recherche et Santé Publique), National Nutrition Direction of the Ministry of Health and Bamako University, the innocent foundation, ECHO and the People’s Postcode Lottery. Have an idea or a comment on any of the issues discussed above? We welcome your feedback – you can comment on this post on our LinkedIn feed or write to us at info@implementnutrition.org. WEBINAR: How Can Advocacy Enhance Implementation Science in Nutrition?